Mouth cancer pictures from chewing tobacco | Smokeless tobacco, dip, tobacco and chewing are dangerous. Not only do they cause bad breath and sore throat, they are incredibly disgusting. 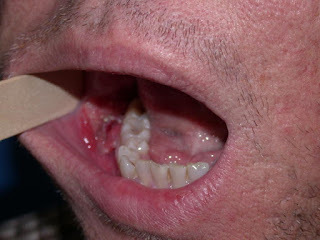 If you can overcome that, there is always the threat of cancer and other oral diseases. Here are some photos of those diseases. Hopefully, this is not you! Click on each photo to enlarge it.